So we asked renowned nutritionist Heather Bauer, author of food-guide-for-busy-people The Wall Street Diet and founder of healthy snack box Bestowed, to sort through the nutritional labels of the most popular brands. What she came up with is a list of her fail-proof picks from five of the biggest juice names in the business. Of course, they’re no exact substitute for the fresh stuff—compared to your go-to juice bar’s blends. They’re are often prepared using HPP, which some say can affect their nutritional punch. (Though that’s not been proven.) That said, many juice bars aren’t using organic or non-GMO ingredients, which some juice bottlers Bauer recommends are. So if your life is unpredictable, busy, or just involves being no where near a juicer, being able to reach for a packaged blend of the green stuff when you’ve got five minutes between meetings can be a real godsend. 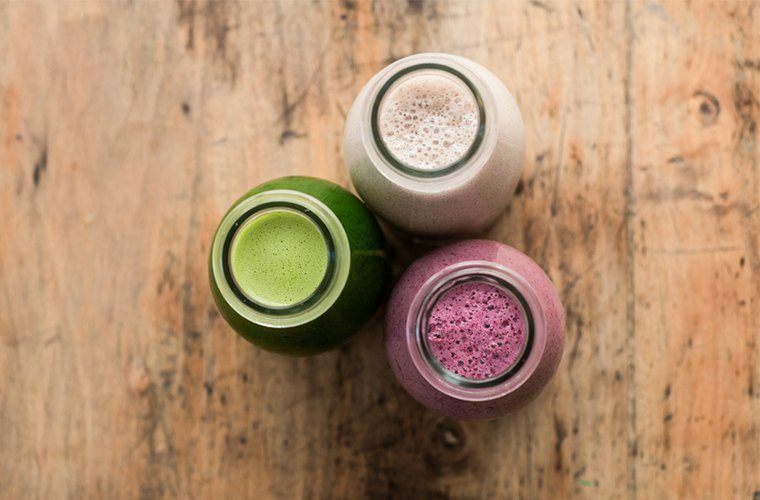 Here, in no particular order, are the 5 healthiest grab-and-go juices, according to nutritionist Heather Bauer. Naked Juice has been around since the ‘80s and, according to Bauer, it’s a great brand because all of its juices are no-sugar-added. Her top pick’s the Kale Blazer, which—clocking in at under 200 calories—makes for a great breakfast or mid-afternoon snack. While kale’s trendiness may have dimmed a bit, “it’s still a nutrition powerhouse,” the nutritionist says. Add in oranges and ginger, and you’ve got a touch of sweetness with an immunity boost to boot. While she’s a fan of Suja’s Elements line (which tend to have less sugar when compared to other juices), her pick is Twilight Protein—a great option because, as Bauer points out, at 10 grams it contains way more protein than your average juice. (Not to mention the fact that it’s vegan-approved, with pea protein and almond milk making up the base.) Plus, it has 4 grams of fiber, which helps you feel really satisfied—super important if you’re, say, stuck in bumper-to-bumper traffic or trapped at the airport waiting for your delayed flight. Evolution Fresh gets serious brownie points in Bauer’s book for being super accessible, since it’s available at Starbucks and Starbucks are, well, everywhere. But Evolution juices aren’t all organic, so be careful to look for those that are, she cautions. If you can, reach for Evolution’s Sweet Greens and Ginger, which Bauer says she’d have for breakfast with, say, a hard boiled egg for protein. It’s organic, non-GMO, and good on the calories and sugar fronts. If you want to be super of-the-moment, Evolution’s Organic Coconut Matcha is a healthy, on-point pick. Odwalla is one of the most ubiquitous brands, and Bauer offers up this word of caution for anyone with a gluten issue: Though people often assume smoothies and juices are gluten-free, not all of Odwalla’s offerings are (some contain things like wheat sprouts, for example). Be sure to check the label. There’s a lot to like about 1915, Bolthouse’s new line of cold-pressed juices: They’re organic, non-GMO, and come in under $4 a bottle. While there is a packed-with-greens option, Bauer’s pick features just strawberry, pear, apple, and lemon, with a coconut water base. “It’s only 90 calories, but packs a nutritional punch! I love that coconut water is the first ingredient because it’s a great source of potassium and helps lower the overall sugar content,” says Bauer. She recommends reaching for it before an early morning workout, or mid-morning when you’re craving a snack. Don’t see one of these brands on the shelf? Here’s how to determine the best juice option, no matter where you are. And if you’ve got the time, here are some green juice recipes to make yourself.